Baldwin joined the practice in 2008, having worked in practices in Kent and Yorkshire prior to that. He became the practice’s clinical manager in 2014, and then a clinical director in 2018. 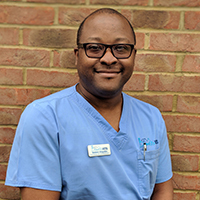 He holds a certificate in Small Animal Medicine and is an RCVS recognised Advanced Practitioner in Small Animal Medicine. His special interests are internal medicine, cardiology, diagnostic ultrasound and dermatology. He has a young a family including a pet rabbit called Harvey. Outside of work he enjoys spending time with family, travelling and is a keen amateur photographer.